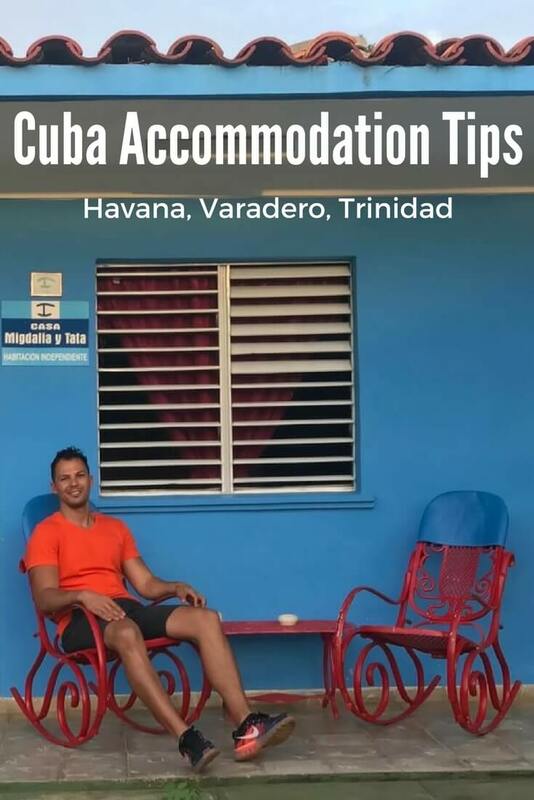 Looking for accommodation in Cuba can be different from everywhere else. That’s because most of the hotels are owned by the government and are outdated, yet expensive for what they offer. Of course, there are exceptions, such as the resorts in Varadero and in Los Cayos, which are international. 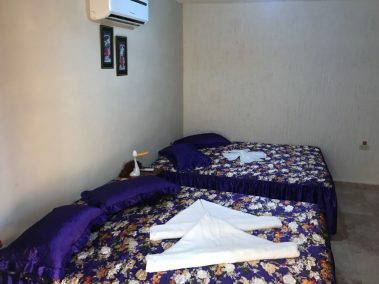 As an alternative, in response to high demand and to provide a source of income for its citizens, in 1997 the Cuban government started to allow Cubans to rent out rooms in their houses or apartments to tourists, even though this was already being done illegally since the early 90’s. 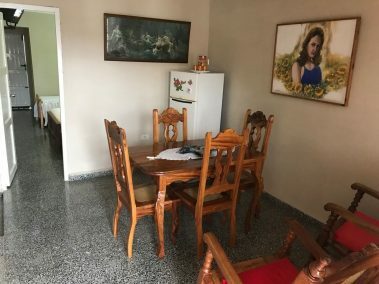 Staying in a casa particular in Cuba you have the opportunity to develop friendly relations with the owners of the house, get deeply involved in the local culture, contribute directly to improve the living standards of Cubans, get some insider tips and at the same time save some money. These are some of the reasons why staying in a casa particular is the best option when you travel to Cuba! Casa particular in Viñales, Cuba. 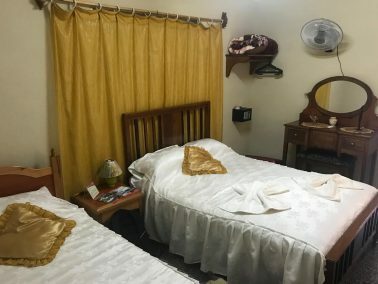 I traveled around Cuba for 20 days in November 2017, and only stayed in casas particulares. I found them through friends and travel blogs, and where I couldn’t find one, I asked the owner of where I was staying to find one for me at my next destination. 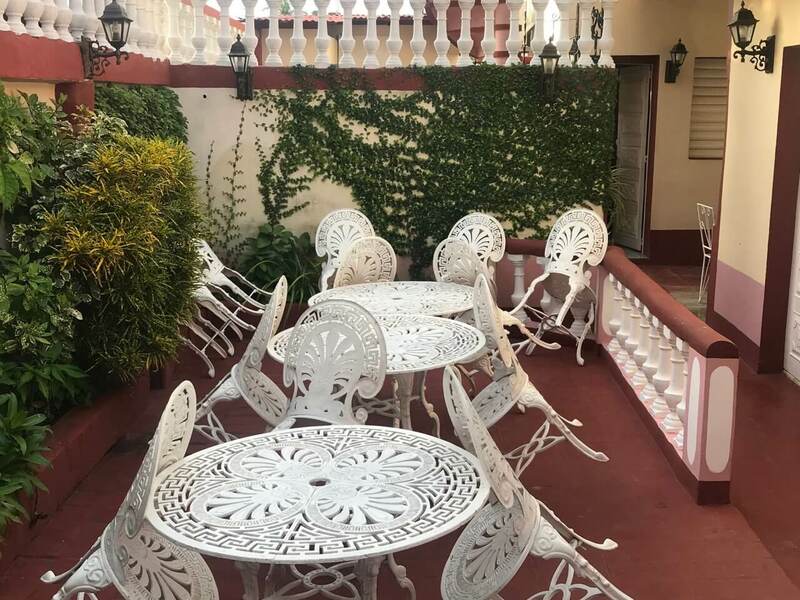 Below you can find my reviews of the casas particulares where I stayed, with pictures and the contacts of the owners, so when you plan your trip to Cuba, you will already know where to stay. The casa particular that I stayed in in Havana is located in Centro Habana, a 20min walk from Old Havana, and a 15min walk from el Malecón. The house, in fact a fully renovated apartment, is on the fourth floor of a five-story building with doorman and a modern elevator. Within a five-minute walk there’s a public square where locals gather to use the Wi-Fi. Note: Wi-Fi is not common in Cuba yet, and you can only find it in public areas, however in Havana it’s also available in some bars and hotels. You need to buy a card in order to use the internet. The 40 m² suite has a very comfortable king size bed, AC, hot shower, plenty of light and provides a great view of Havana. It acccommodates two, but they can easily set up an extra bed for one more person. The bathroom of the suite. The owner, Maria Izabel, was very friendly and attentive, and regularly asked if everything was Ok. She provided an excellent breakfast every morning (not included in the reservation), and we chatted quite often. Having breakfast with Maria Izabel and my friend Alana. Address: Maryhouse, Av. Salvador Allende 603 apto 55 e/ Oquendo y Marquéz González, Centro Habana, Cuba. Contact: You can contact them on Facebook or via email (agbjesus@gmail.com). Viñales was the city in Cuba where I found the most availability for casas particulares. Everywhere there were signs for rooms for rent. 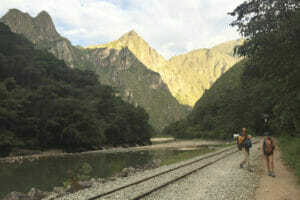 I stayed in a casa particular located three blocks away from Viñales’s main street. The owner, Sra Carmem, was very friendly, and we had an opportunity to talk about Cuban history and other subjects. The bedroom was a good size, had a fan, AC, TV, a single and a double bed, but the mattresses were not good. The bathroom wasn’t laid out well, either, with the floor at different levels that presented a serious trip hazard. I only had breakfast and dinner once (in most of the houses you can request dinner and breakfast at an extra cost). The breakfast was good, but unfortunately the lobster that I had for dinner gave me a bad stomach for almost a week. Furthermore, some of the neighbors were really loud and I even saw cockroaches in the room. That’s the reason this house owned by Carmen and her family was my least favorite casa particular in Cuba. If I come back to Viñales, I would also choose a casa particular closer to the main street. 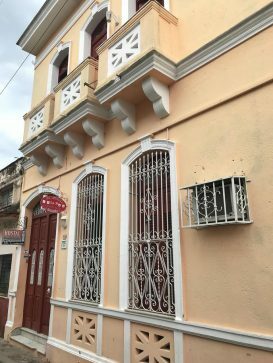 The casa particular that I stayed in Cienfuegos was the biggest among all the ones I stayed in Cuba. My friend and I had the second floor of a doctor’s house entirely to ourselves . With a balcony, a living room, a suite with a single and a double bed, TV, fan, AC, safer, hot shower and even a backyard. The location was also wonderful, in the center of the city. I didn’t have much opportunity to chat with the family, but they provided us with some helpful information on how to get around the city, and even gave me some medicine for my bad stomach. Another big casa particular, this time in Trinidad, with very friendly owners, was the second floor of a newly built house located near the Trinidad Historic Center . 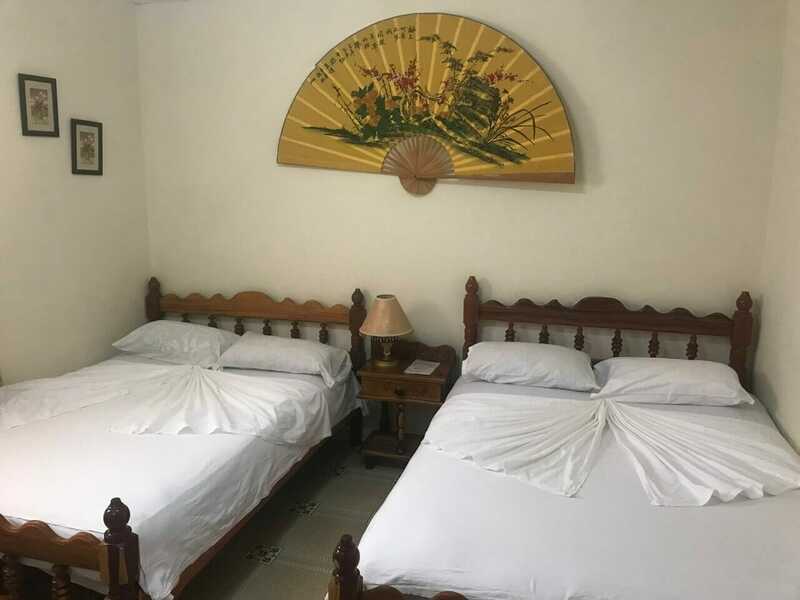 The room was new and had very comfy double beds, AC, hot shower, and I loved the fact that the breakfast was served on a nice terrace surrounded by huge trees. Walking around Trinidad was easy and the house was very close to the bus stop to Playa Ancon and the historic center . However I had a hard time finding the house upon arrival because no one knew its location. If there was a place that I really wanted to visit in Cuba besides Havana and Trinidad, it was Cayo Coco. 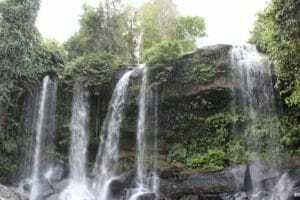 But I wasn’t really sure if it would work out because there are only resorts in the cayos. So, I planned to stay in a casa particular in Morón, a city close by, and from there take a day trip to Cayo Coco and Cayo Guillermo. After confirming that it would be possible, Yanara from Yanara Fambyh Hostal in Trinidad, booked a casa particular for me in Moron. That house has four rooms for rent and I stayed in one in the rear. Again, the mattress wasn’t good, but the owners were extremely friendly and charismatic. 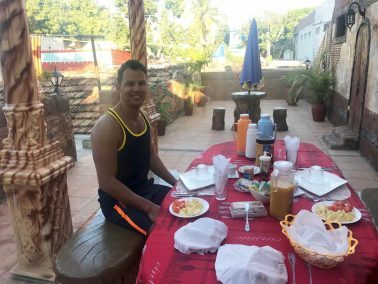 The breakfast was served in a lovely open area and I ended up booking a day trip to the cayos with the owner of the house. The patio where the breakfast is served and my room’s door opened on the right side. Yet another last-minute booking. My casa particular in Santa Clara was booked by phone just one day prior to my arrival. The house is located on the second floor of a two-story art deco building with a rooftop deck in the heart of Santa Clara, had some Christmas decorations and a big picture of the owners’ sons. 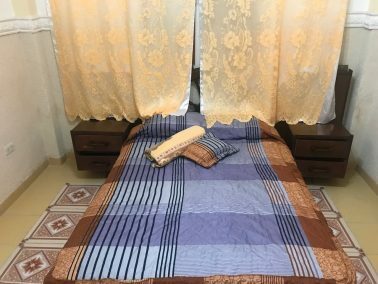 The bedroom with its high ceiling is spacious, has a double and one single bed and hot shower; and the owner allowed me to do a late check out. The front of the the house. Part of the living with some Christmas decoration. In Varadero something very funny and unexpected happened. 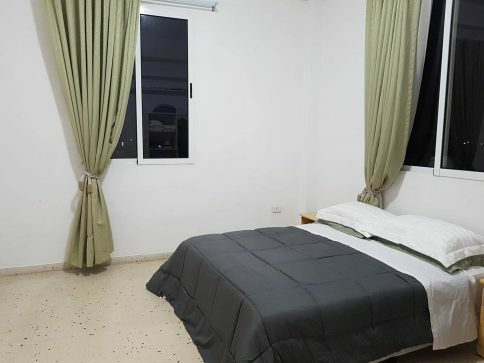 I booked and confirmed a casa particular in Varadero one month before my trip but, on my way there from Santa Clara, I discovered that the reservation wasn’t actually confirmed. 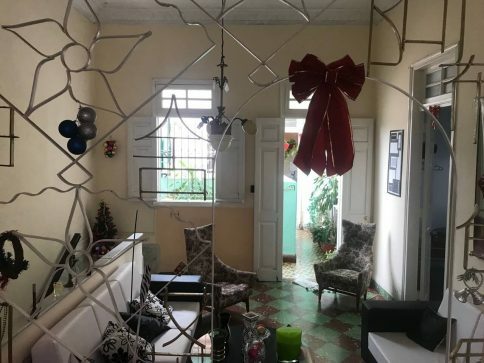 So, Yanara, my Cuban angel, booked another house, but when I got there, that casa particular was fully booked, so the owner sent me to her “sister’s” house. I ended up having a whole house all to myself (and my friend who was traveling with me). The owners live in another house on the property, and rent the two-bedroom house to guests. The house was very close to the beach in a quiet area, and had a beautiful and cozy front yard. The bedrooms were fine, but the bathroom wasn’t that good and the breakfast was poorly served compared to the others that we had. 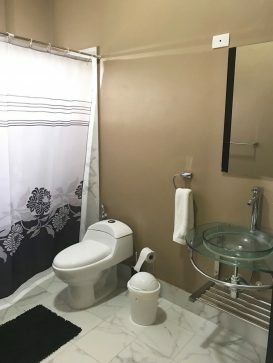 Note: The two bedrooms are connected by the bathroom. The nice and coy front yard. 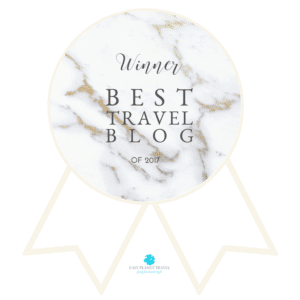 • When you book a casa particular in Cuba make sure to email the owners weeks in advance and give some time for them to reply to your email. Twice I had already booked another house because the owners took too long to reply to my emails. • Prefer houses / bedrooms that are newly renovated or built so that the fittings may be better and everything working properly. • A casa particular in Cuba charges an extra fee for breakfast, 5CUC, and for dinner 10CUC. Although the breakfasts have a higher price than the ones served in restaurants, it’s totally worthwhile and simpler than looking for good places to eat. In Cienfuegos for example, I had a hard time finding a place to have breakfast and my friend never liked the food served in the cheap places where locals eat. Dinners are cheaper in restaurants, especially if you eat pizzas and burgers. 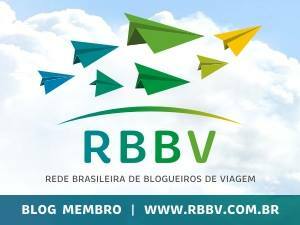 • I don’t recommend doing AirBnB because I heard from both sides, owners and guests, that they had some complications to pay/receive the money because of the embargo. • Bear in mind that a casa particular in Cuba is very simple and that most of the owners don’t speak English. 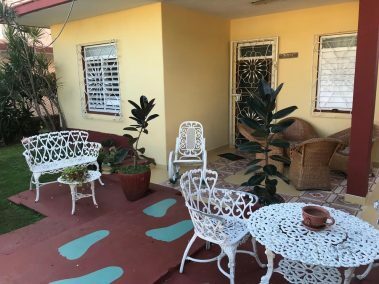 • Staying in a casa particular in Cuba is not only a way of saving money, but also to have a cultural exchange and to contribute directly to improving the living standards of the families. Be open to conversation and practice your Spanish. 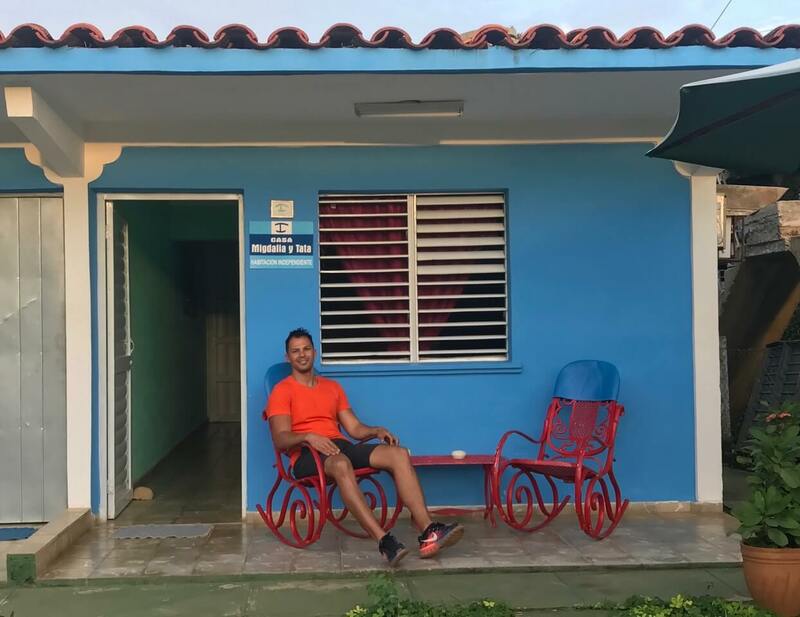 • For a richer experience I definitely recommend staying in casas particulares in Cuba, and I would do it again for sure. • If you can’t find a room you can contact my Cuban angel Yanara and ask for some recommendations (phone:+53 52992927 or via e-mail: yanara104@gmail.com). • Always negotiate the price, specially during the low season. Safe travels and enjoy this marvelous island. I’m curious if you traveled under a US Passport or not. I just started looking into going to Cuba and the best way to go about it. I have a French passport, but my husband has a US passport and I’m finding tour companies are the way for Americans, but find they are SUPER expensive. Yes, Americans have some restrictions but I believe they can also travel to Cuba by themselves. Really glad to hear that Lorial! !